Quince is a late fall fruit that is a perfect addition to the Thanksgiving table. Well-suited for preserving, quince is naturally high in pectin, a thickening agent for jams, jellies, and confections. The fruit is perhaps most famously known in the form of membrillo. Quince was first cultivated in Ancient Persia, before spreading to southern Europe and the Middle East. The Ancient Roman cookbook Apicius features several quince dishes, including “A Sauce for Broiled Tooth Fish” made with quinces, lovage, coriander, and honey. Quince trees were common in colonial home gardens, however, they have declined in population in the U.S. because they are highly susceptible to fire blight. Until commercial gelatins were introduced in the 1890s, quince was a commonly used as a natural source of pectin. Cooking quince turns the flesh from white to anywhere from a light rosy pink to a deep, dusky red. According to food science expert Harold McGee, heat forms anthocyanins, natural pigments that can appear red in color. The Latin word for quince is melimelum, translated to marmelo in Spanish and Portuguese, from which we derive the word marmalade. Although we now think of marmalade as preserves from citrus fruit, the word originally specifically referred to quince preserves. It’s said that quinces used to be stored in household closets to scent linens and clothing. Quinces (Cydonia oblonga), like apples, pears, plums, cherries, and almonds are in the rose (Rosaceae) family. According to the USDA, less than 200 acres of quince are grown commercially in the US. Pear plants are grafted onto quince rootstock to produce a pear tree that is smaller in stature, and thus more easily harvested and maintained. Quinces are high in Vitamin C and fiber. The seeds and fruit are used in herbal medicine to treat digestive problems and cough. Under-ripe or barely ripe quinces tend to be a greenish-yellow, while ripe quinces turn golden yellow. The skin is thin and easily bruised and blemished, and before cooking, most quince flesh is creamy white in color, with a core inside just like an apple or pear. 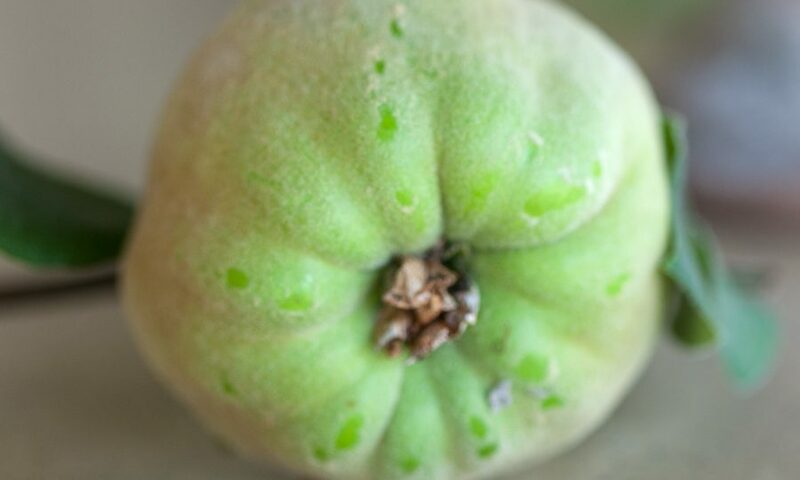 Quinces are frequently covered with white fuzz that must be rubbed off before cooking. Store quinces on the countertop for up to a week, or in the fridge in a paper bag for several weeks. It’s said that quince used to be stored in household closets to scent linens and clothing! Like apples and pears, quinces pair well with warm spices like cinnamon and cloves and with rich-tasting sweeteners like honey. The quinces we get in the US cannot be eaten raw – they are too astringent and sour. Some varieties grown in Iran and other warm quince-growing areas can be eaten out of hand. Generally however, they must be baked, poached or simmered, usually with copious amounts of sugar, honey, or other sweetener. Preheat oven to 350ªF. Peel quince and cut into quarters with a heavy chef’s knife. Cut out the core with a sturdy paring knife, then slice quince into ¼ inch slices. Place the quince, white wine, white wine vinegar, sugar, sea salt, vanilla bean, and peppercorns in a small roasting pan. Cover with parchment paper and then foil. Bake until quince is rosy in color and tender, about one hour. Strain off the liquid and let it cool, then stir in champagne vinegar. To serve, pour two tablespoons in a glass with ice and add sparkling water. The leftover quince can be served as a condiment to roasted meats such as turkey or pork, as an accompaniment on a cheese plate, or a topping on yogurt. Learn more about fall produce in season now. This entry was posted in Eat Good Food and tagged fall produce, quince.